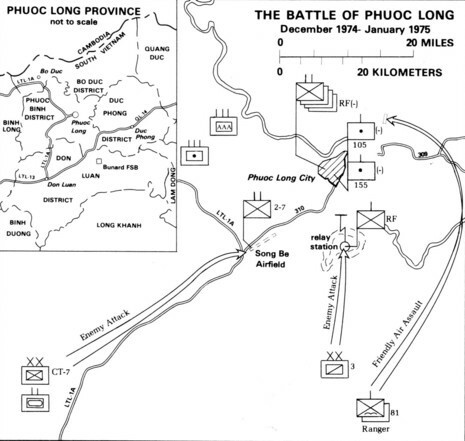 The Battle of Phuoc Long took place in Phuoc Long Province, about 100km from South Vietnam's capital, Saigon, at present day Phuoc Binh. The campaign against Phuoc Long reflected North Vietnam's change in policy after the strategic raids of 1974, taking full advantage of South Vietnam's critical military situation. The North Vietnamese logistical situation, however, had not drastically improved and this hampered the speed of the offensive. Nonetheless, the North Vietnamese displayed both tenacity and skill as they assembled for combat during early December 1974. The DRV opened their campaign on December 13, 1974, with elements of the VPA 301st Corps, including the newly-formed 3rd Division and the 7th Division, launching their attacks from Cambodia. They were supported by one tank battalion of the M-26 Armour Group, one artillery regiment, and one anti-aircraft regiment, as well as several local sapper units. The five South Vietnamese outposts in the Phuoc Long province were important because they lay across the east-west and north-south supply lines used by the NVA in the Saigon area. While an obstacle to the Communists, their location placed them far north of the main South Vietnamese defense line in Military Region 3. Major concentrations of COSVN infantry and special units, such as the M-26 Armor Command, bordered ARVN's position on three sides. The government soldiers had as their only links to outside help Route 14 to the south and an airfield big enough to land C-130 transports at the capital city of Phuoc Binh (also known as Song Be or Phuoc Long City) almost in the center of the province and about 110 kilometers northeast of the nation's capital. The forces in the government salient kept enough ammunition stored for a week of intensive combat before they required resupply.